Superb Dancing - salsa, lambada, pelvic thrusting, pelvic gyrating with salsa arms and free flowing body movement - just imagine it whilst listening to the music . . . free MP3 files available here . . . The music is inspired by Brazilian traditions, often using native instruments straight out of the Amazon rainforest jungle. Whilst the dancers are familiar with dances of antiquity (Dionysos - Dionysus is alive and well here! 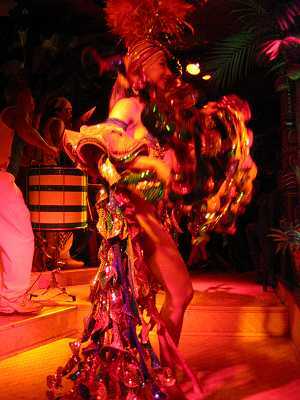 Dionysus is often compared to the ancient south American god Quetzalcoatl who is always depicted as feathered like a bird, son of the sky-god Mixcoalt), they are as familiar with modern synchronised dance routines and dancing teachers come from London to see the outstanding Salsa routines. If one can capture happiness and encapsulate it into a package, these recordings do just that. But beyond encapsulated packages of undiluted joy and happiness . . . visit the Pam Pam for real! We made some recordings of the music one summer evening of 2005 and we hope that our online MP3 music tracks help you either to enjoy the memory of the spirit of the place . . . or to introduce you to it for the first time. feature the most incredible drumming, Salsa rhythms and tribal beats. 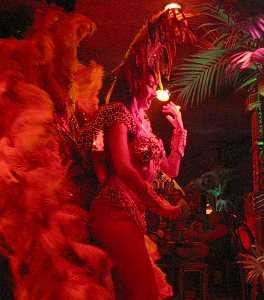 During some of this music, Brazilian dancers wearing fantastic bird-feathers do dance tribal observations of bird mating dances with arm movements which correspond to those of the bird wings. It's a real sight and this drumming music will evoke fantastic images. During some dances the dancers engage in pelvic thrusting and pelvic gyrating which is a type of belly dancing of an extraordinary sort: their footwork involving very small and fast steps produces ripples and standing waves through every muscle and ounce of their bodies which you won't see being done anywhere else in Europe. are some of the best of salsa dance music that you'll hear. They're just as wonderful listening to them in a traffic jam in your car as they are practicing your salsa dancing at home. Make no mistake - this place can be taken for a Disney look-alike - or perhaps the sort of place that Disney tries to emulate - but the PamPam is not just vain spectacle. These are the true dancers of the Quetzalcoatl tradition. Put the spectacle aside, the dancing here is serious stuff - it's about gyration and movement. And yes, if you want to get distracted by it the spectacle is quite something too . . .
You'll get a flavour of the dancing and permanent birthday party atmosphere from the Antibes site and dates of events from their offical site. SERIOUS HEALTH WARNING! - This Salsa music is contagious and infectious. We take no responsibility for it taking over your brain and can offer no remedy . . . other to enjoy it, and then to visit Juan Les Pins for real if necessary taking an EasyJet flight just for a PamPam weekend doing nothing else but coming here . . . 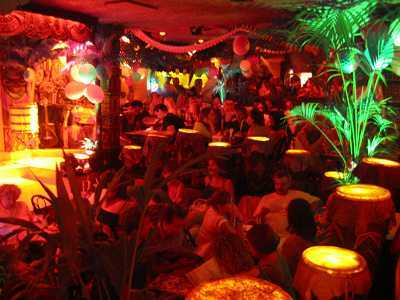 The Pam Pam in Juan Les Pins is world-class entertainment at its supreme and there is nowhere which compares in western Europe. To experience this place at its best, we are serious about Pam Pam weekends - you could justify taking an Easyjet flight to Nice and booking a hotel in Juan Les Pins for just one night . 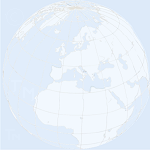 . . or find a holiday villa or apartment in Antibes for a week, or a month. The entertainment is best during the July and August peak season but other events happen in the course of the year. The season finishes with a Halloween flourish. Further information about Quetzalcoatl is available from Alice Bailey, a descendant of Benjamin Henry Latrobe. Some would say that Dionysus is diametrically opposed to Apollo and that Quezalcoatl music is the devil's music - it's wonderful - try it! (Aren't forbidden fruits always more exciting?) Some say that Dionysus and Quetzalcoatl are the saviours of the world. Enjoy the music! It will save you . . . but WARNING - after hearing this music you will live only ever looking forward to visiting the PamPam again! Quetzalcoatl was the legendary white king in south America whose name means "serpent of the clouds" and who taught all the sciences to mankind. He wears a fether-cloak to symbolise his origin in a celestial ship, just like Kukumatz in Guatemala. The plumes symbolise flight in the civilisations of the Olmecxs, Toltecs, Aztecs and the Maya. The dances which we see performed in feathered costume derive from these ancient traditions.